Breville BES870XL Barista Express Espresso Machine is amongst the best semi-automatic espresso machines which can be easily used by beginners and have highly customizable controls for experienced baristas. We’ve recommended this machine in best espresso machines 2017 in our previous article. Breville has made several improvements over the preceding (860 XL) version. The notable improvements include design makeover and more control over brew temperature. What do people like about Breville BES870XL? To prepare a great espresso, the grinding should be both fine and quick. BES870XL comes with Burr Grinders that can grind coffee beans in a few seconds and sends it over to prepare espresso within minutes. If you are an absolute beginner, you would love its two dual-wall, pressurised filters that regulate the pressure and optimizes the extraction, leaving you with a perfect espresso without worrying about complex functions. If you are an experienced espresso lover, you would love two single-wall, non-pressurized filters which power you with the ability to experiment with different grind sizes, grind amount and tampering pressure. For an a nice espresso experience, the machine comes with a themocoil heating system. It marks an important improvement over its predecessor, the 860 XL. This heating system ensures accurate regulation of water temperature. It is complimented with a pre-brew function that ensures optimal distribution of coffee through the coffee pluck. Integrated Conical burr grinder & ½ pound bean hopper: It maximizes the surface area of the grind which optimizes the extraction of flavour from the bean. Dials to select Grind size and grind amount: Lets you chose a wide range of grind settings, ranging from fine to rough grinding. It also allows you to decide the quantity of espresso that you want machine to pick up – a feature that comes very handy for experimenting. Hands-free grinding cradle: Once you push portafilter into the cradle, the grind espresso will be dispensed directly to the filter. The system is automated, so the grinder will automatically stop once the required amount of coffee is dispensed. Add-on features: It has a filter size button to indicate whether you are using a single or double-wall filter basket, and based on that it would dispense the right amount of coffee. Although Breville has put in a lot of effort on designing and performance, some features like hot water dispenser could have been improved. Moreover, while the machine itself works well, it does require diligent maintenance. A few skipped cleaning sessions can make your grinder loud, although it is easy to get a replacement; it nevertheless remains a weak point. The machine is relatively taller in size, so before you plan to buy it, make sure you go through dimensions to see if it really can fit in your kitchen. You can also checkout our best espresso machine buying guide 2017 if you need espresso machine for home or office use. It is not a commercial grade machine, so it works well if you make about 20 cups of espresso daily. It is 110V/60 Hz, meaning you can use it anywhere in the US. Comes with all add-ons that you need to make an espresso. It is primarily meant to grind espresso beans, however, if you have other types of beans, you can grind the same in this espresso machine, and change the grinder settings as per your requirements. It is best to clean the portafilter handle assembly & filter basket after every use. Additionally, purging a small amount of water through the group head to dislodge any grinds should give you a complete cleaning. 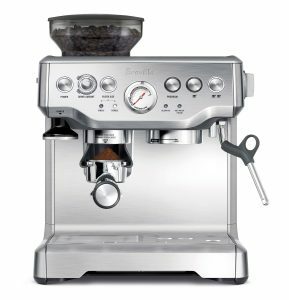 Overall Breville BES870XL Barista Express Espresso Machine is a good buy for home use – roughly about 20 cups of espresso per day. It comes at an attractive under $600 price tag and a wide range of features. The post Breville BES870XL Review – Do NOT Buy Before Reading This! appeared first on MrCoffee.